An 1898 photograph of Domino's grave at Hira Villa, now Mount Brilliant. 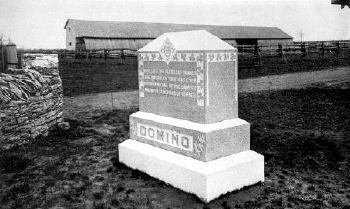 Although he died at CASTLETON STUD, James R. Keene's DOMINO was buried at the entrance to HIRA VILLA FARM, north of Lexington on the Huffman Mill Pike. It was then the property of DOMINO's breeder Major Barak Thomas, who had bred the great colt at Dixiana Farm a few miles to the east. Thomas sold Dixiana when in financial straits and moved to this property, Hira Villa, named for Thomas' favorite mare HIRA, dam of HIMYAR (sire of DOMINO). HIRA is said to be buried in the same area as DOMINO, in an unmarked grave, as is DOMINO's dam, MANNIE GRAY, also dam of DOMINO's older full sister CORRECTION, a champion racemare. The farm is now known as MOUNT BRILLIANT FARM, named for the old mansion on the property. -- A.P.